The National Police has issued a clarification letter regarding a Radio Free Asia broadcast reporting on the alleged corrupt practices of Major General Koeng Khorn, chief of Svay Rieng provincial police. 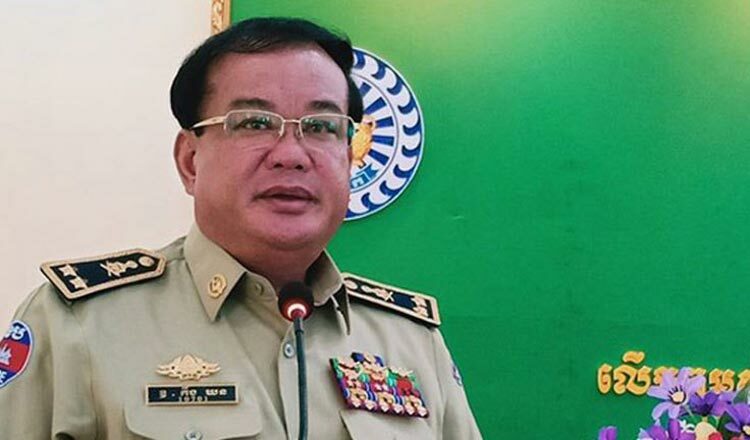 According to the letter issued by the National Police’s personnel department on Monday, Radio Free Asia recently reported about a complaint from 60 unnamed provincial police officers accusing Maj Gen Khorn of committing corruption and nepotism. The letter said that the provincial administration had already responded to the matter, and found Maj Gen Khorn had done a good job and had many achievements. The letter noted that investigators did not find any proof of corruption or any irregular appointments of officials. “Based on the leadership of Major General Koeng Khorn, most provincial police officials supported what he is doing and he has always taken care of them,” the letter said. Additionally, according to the complaint mentioned in the RFA report, a group of 36 unnamed provincial police officials is also accusing Maj Gen Khorn of amassing thousands of dollars and countless assets through corrupt practices during his tenure as chief of provincial police. Brigadier General Pech Virak, deputy provincial chief of police, yesterday said the report was untrue and slanderous. Brig Gen Virak said that his superior has done many things, including building new sections to the provincial police headquarters. He also said that Maj Gen Khorn instructs people to exercise to improve their health. Maj Gen Khorn could not be reached yesterday for comment.